Philip is an experienced non executive director with background in large multi -national business and small and medium enterprises. A significant and active figure in MK business and sporting circles, Philip has a lifelong interest in football having been chairman of Leicester City FC and currently local side Stony Stratford Town. Chairman of MK Sports Board. Lifelong interest in football and cricket in the MK area. Chairman of local football club and vice president of local cricket club. Governor of University of Bedfordshire, Deputy chairman of MK Academy, formerly governor of De Montfort University — honorary doctorate for contribution to university. Member of MK Higher Education board. Former director of MK Hospital Trust and former chair of MK Urgent Service Limited. Patron of Willen Hospice. Experienced operator at highest level and extensive network of contacts. Speaker and presenter of dinners and events. Throughout Philip’s business and voluntary life he has always strived for and been involved in change for better value and greater effectiveness. Major change programme was conducted under his leadership at Entrust, the regulator for the Landfill Communities Fund. 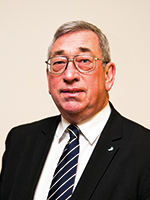 Philip is also responsible for the creation of MK Business Council and MK Sports Board. Former senior executive of both Asda Group plc and National Power plc and previously in engineering businesses. Currently chair of a number of SME’s in the Renewables Sector. 45 years of commercial activity.